I used to be the only one in our house who loved granola, but something changed and now the whole family can’t get enough of it. Maybe it’s the weather? I don’t know, but since granola disappears so quickly now I’m making more of it and fine tuning old recipes. This one is my current favorite. It’s a granola without oil that is very crunchy (as opposed to light and crispy) and sweet. The best things about this recipe are the nuts and the big clumps. It’s definitely the type of granola you put in a cup and eat with your hands rather than something you’d sprinkle on something else. You might break a tooth! Hmm, maybe I shouldn’t have said that. It’s crunchy, but not that crunchy. It’s pleasant! Here’s the recipe. Preheat oven to 275 degrees F. Line a 12x17 inch rimmed baking sheet with parchment paper. Put 3 cups of the oats in a large bowl. Grind the remaining half cup of oats and the flax in a mini processor or old coffee mill. Add the ground mixture to the oats. Add the seeds and salt and stir well, then stir in all the nuts. Put the brown sugar and water in a large microwave-safe measuring cup and heat on high just until it begins to boil. Stir to dissolve the sugar, then stir in the vanilla. Pour the mixture over the oats and stir until well blended. Empty the mixture onto the baking sheet and press it down flat as if you were making a giant granola bar. Bake for 45 minutes, checking after 20 minutes or so to make sure granola is cooking slowly and edges aren’t burning. During the 20 minute check, Use a spatula or scraper to lift and flip the granola from the edges and push it towards the center. In other words, break it up a little, but leave it in big chunks. Check granola at 45 minutes and if it appears to have browned somewhat, go ahead and take it out. If not, leave it in for another 10-15 minutes. Granola will not be crunchy until it is completely cool, so let it cool on the baking sheet. Once cool and crisp, toss with the dried fruit. You can skip the step of grinding the oats and/or flax completely, but you will probably get fewer clumps. I've found I get more large clumps if I incorporate some sort of ground meal (the oats and/or flax) into the mix. Also, this granola is pretty hard and crunchy. If you want to trade some of the hardness for crispness, incorporate a bit of oil. 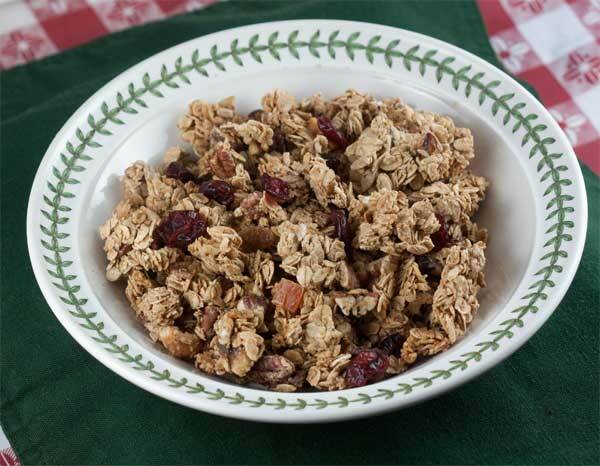 Two tablespoons of foil makes the granola lighter and less hard. However, adding any more oil than makes the granola a little looser and not as clumpy. Higher oil granolas tend to be looser. Sounds delicious!!!!!!!!!! I love to start off the day with homemade granola, although lately I’ve been doing more muffins and scones. My favorite granola recipe is here: http://allrecipes.com/recipe/megans-granola/ for those maple-lovers with a serious sweet tooth!